Asset recovery remains high on the global agenda. In addition to continued attention from the United Nations, the issue was included in the Sustainable Development Goals under Goal 16.4, which aims to “significantly reduce illicit financial and arms flows, strengthen recovery and return of stolen assets, and combat all forms of organized crime”. Like other countries in the Southeast Asia region, Indonesia faces serious challenges due to corrupt practices and embezzlement of public assets, resulting in a staggering negative impact on its political, social, and economic development. Most stolen assets are spread out worldwide, demanding international cooperation. The Indonesian Government is dedicated to eradicating corruption. Two Presidential Instructions were introduced on the prevention and eradication of corruption, including an action plan for asset recovery. And, Indonesia has been active in signing mutual legal assistance agreements with countries such as China, Singapore and Switzerland. Justice and Human Rights Minister Yasonna Laoly reaffirmed Indonesia’s commitment to eradicating corruption at the Seventh Session of the Conference of State Parties to the United Nations Convention Against Corruption (UNCAC) in his remarks: “Differences in justice systems should not hinder the effectiveness and success of cooperation in international asset recovery. What is most important is political will." Despite these significant efforts, the process of asset recovery remains complex and coordination among relevant agencies is challenging. The Asset Recovery Centre (Pusat Pemulihan Aset or PPA) established by the Attorney General’s Office (AGO) has limited human resource capacity - officials often lack the relevant knowledge to effectively gather intelligence, analyze data, trace assets, conduct financial investigations and collaborate on an international level in English. The process of asset recovery can be complex and time-consuming, requiring expertise and political will. Each step, from tracing, freezing, confiscation and repatriation, presents its own unique obstacle. Relevant institutions in Indonesia, such as the AGO, the Corruption Eradication Commission (KPK) and the Ministry of Law and Human Rights (MoHLR), lack resources and asset recovery experts needed to take on cases. Coordination between agencies remains challenging due to the design of mutual legal assistance process under Indonesian law – both the AGO and the MoHLR have the authority to handle cases. Agencies face obstacles when sharing information from their respective databases to improve the recovery of state assets from foreign jurisdictions. 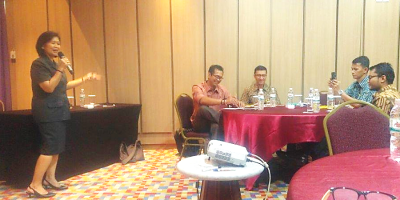 To address capacity building and interagency coordination, IDLO is managing a project, implemented by partner organization Kemitraan, to assist Indonesia’s Asset Recovery Centre (PPA) and other agencies in effectively carrying out their responsibilities and improve asset recovery across borders. The project, “Capacity-Strengthening of Indonesian Government on cross-border Asset Recovery and Mutual Legal Assistance Program” (SIGAP), is funded through the Indonesia-Netherlands Rule of Law Fund of the Embassy of the Kingdom of the Netherlands in Jakarta. The project activities aim to build the capacity of the PPA and other relevant officials through training based on the results of a needs assessment and evaluation of the PPA’s structure, legal framework and strategic plan. To establish a solid coordination protocol among agencies, IDLO co-organized a workshop in 2017 to revise the original PPA Guidelines on Asset Recovery. Changes to these guidelines aim to clarify responsibilities held by the different AGO units, update materials to adequately respond to financial technical developments, such as bit coins, and to enhance cross-border asset recovery mechanisms both as a requesting and requested country. As a result of the workshop, the AGO-approved guidelines will be used to inform a Standard Operating Procedure for the PPA. The project will then focus on a comparative study with other countries, including the Netherlands, resulting in a road map to further strengthen asset recovery in Indonesia.